Happy Friday! I have nothing fashion-related to share so instead I’ll give you a list of random thoughts. 1. How amazing does this homemade Italian Wedding Soup look? I just want to climb up in that bowl and devour it all. 2. I woke up in this morning with plenty of time to make it to spin but instead decided to find a workout On Demand. I did a 35 minute Xtend Barre workout and man, was it tough. I was sweating almost immediately and my legs were feeling the burn. 3. The #Elf4Health challenge today is to eat as many colors as possible. So far I’ve had a RED apple, a YELLOW banana and some BROWN almond butter. Three down and it’s only breakfast! 4. I am almost done with my holiday cards. I bought two sets last year when they were on sale and then stowed them away in my room only to forget about them and then accidentally discover them. Hello, Mom, is that you? 5. Please tell me you’ve all seen this video of the First Dog Bo checking out the White House holiday decorations. It’s hilarious. 6. I went to Cava last night for dinner with a friend and we ordered way too much food but it was all delicious. Pita bread, lamb chops, chicken pita, crispy brussel sprouts, baked feta with honey and taramasalata (new discover that I love love love). No pictures, blogger fail. 7. The Giants will be at FedEx field on Monday night and I will be there screaming my head off for them. Big game, go GMEN! 9. 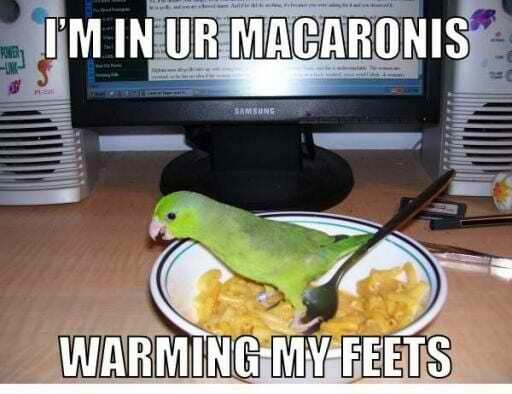 Monica posted this earlier in the week and I can’t stop laughing about it. 10. I have not gone on a run since the half marathon. Truth. Last evening Stephanie and I went to dinner with a few co-workers at Woodward Table. I am always a fan of trying new restaurants in town and it was a nice way to close down the election season and begin the holiday season! Woodward Table has all the makings of a new D.C. restaurant. Duck, fish, chicken, pork offerings for entrees, flat breads and charcuterie to start, kale and carrot salads and french fries with aioli or mac and cheese as a side. With all that said, I completely indulged on all of this throughout the night. Stephanie and I shared the mac and cheese as a side. This was the highlight of my meal. It was covered in buttery Ritz crackers and was super creamy and good. For dessert we shared a few desserts, this one here is the apple sampler which someone commented is kind of full of apple – indeed it was. Apple muffin, the blob like thing is apple upside down tart, white chocolate apple mousse and apple cider sorbet. I also was reminded earlier in the day what a great after dinner drink Bailey’s is – both in coffee and on the rocks. So, I ordered one of those which sufficiently put me over the top in terms of my fullness for the evening. In #Elf4Health related news I attempted my meditation and reflection of the day this morning. I think I might need to give it another shot, I didn’t succeed on focusing on just one thing, my mind was kind of racing from one thing to the next – mostly about what I wanted to get done before I went to work. I think I might give it another shot this evening when I get home – just to prove to myself that I can do it! December 1st is just around the corner and what does that mean? Holiday party time! Everyone’s calendars seem to fill up instantly around this time of year with parties, receptions, dinners and let’s face it, overindulgence. I really enjoyed Ashley’s post the other day about getting back on track after holiday indulgences and I started to think about what my plan will be the next month in order to keep on track – especially since I an no longer following a training program. I’m going to aim to break a sweat at least 5x a week. And most of these sweat sessions will have to be in the morning. Just next week I have evening commitments on 4 weeknights. Time to turn back into an early riser! I am also going to commit to making my breakfast and lunch at home every day so I can bring healthy, portion-controlled meals to work and am only indulging at the actual holiday events. Why waste calories (and money) on a breakfast treat or lunch out when I know I can enjoy the good stuff when I go out at night? It’s just not worth it. Lastly, being part of the Elf4Health Challenge through the holidays will be a great reminder to keep up the healthy living lifestyle. The holiday season can totally be about moderation and still fun at the same time. I plan on decorating my apartment this weekend and getting my mini-tree to get in the holiday spirit. What are your plans to keep things in check during the holidays? Tuesday’s meals highlight: Creamy polenta and crockpot rump roast with onions – SO good and SO easy! It is day 3 of the Elf4Health challenge and Stephanie and I have completed the challenge of the day: trying a new workout! I usually go to my gym on Tuesday mornings for a class that I love and there is a Wednesday morning SweatShop class that I never considered going to until the daily challenge came up. I convinced Stephanie to go with me and it was a success! In addition to the new work out this morning, I also tried a new breakfast. 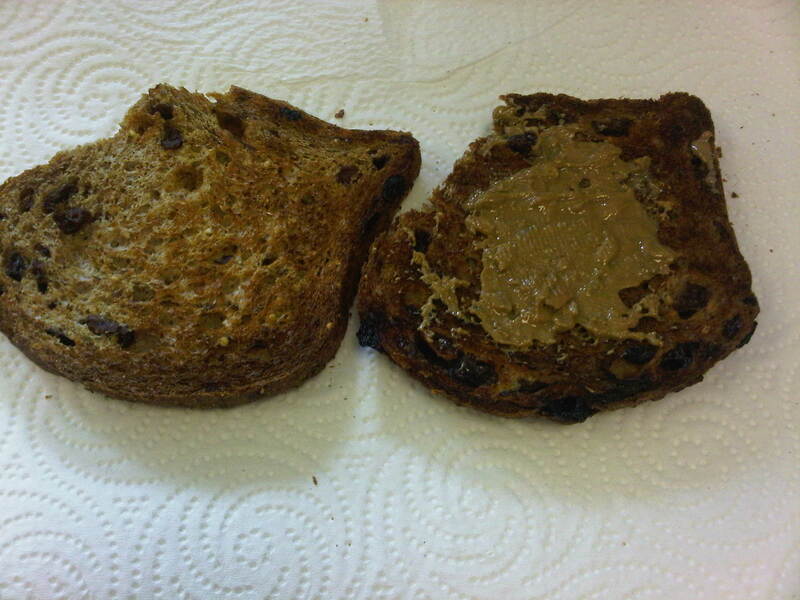 I bought Ezekiel cinnamon raisin bread and brought two pieces to toast this morning. One with sunbutter, the other without. I wasn’t quite sure if I was going to like the sunbutter on top so I had to eat it first before adding it to the second one. I did end up adding it to the second one and devoured it. Speaking of sunbutter, I sort of fell out of love with it a few months ago, but had a taste for it the other day and I bought the natural crunch version. I love it and am happy to have it back in the rotation. 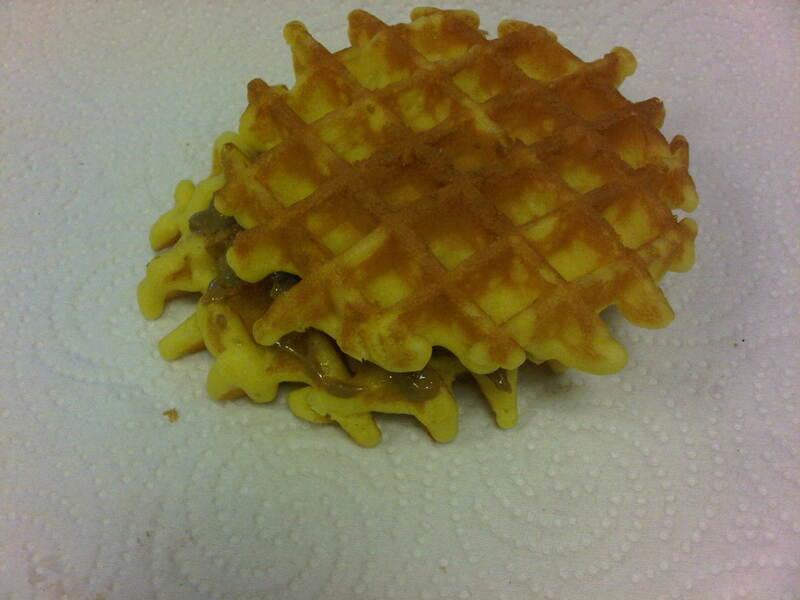 Waffle and sunbutter sandwich! I know it’s only day 3 of this challenge, but it has been so fun already. I love connecting with my new elf buddy. In addition to having a new elf buddy, I also obviously have Stephanie here too and it’s been great to be able to make plans for challenges together. 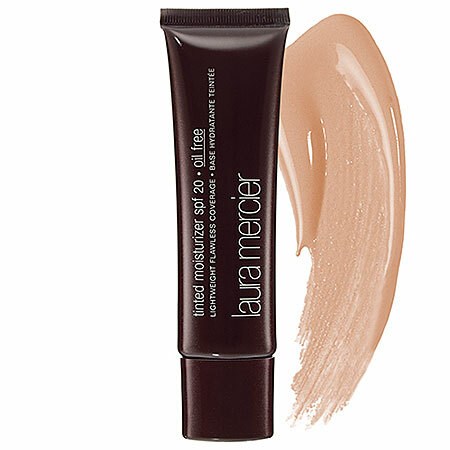 Laura Mercier Tinted Moisturizer – It’s light, smooth and lasts forever. I love it and it’s totally worth it’s $43 price tag. 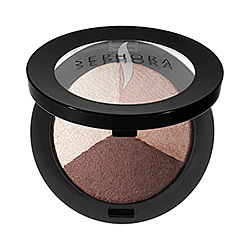 Sephora eyeshadow – This little trio works perfectly for me because it’s neutral but can still be played up at night with a heavier-hand, some eyeliner and some extra mascara. Plus the $16 price tag is perfect. Clinique High Impact Mascara – I just started using this a few weeks ago and I love it. Perfect coverage for the day and yet can totally be turned up for night. It has a great brush too and is $15. 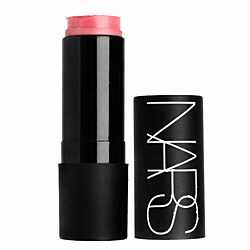 NARS “The Multiple” Stick – I mainly use this stick for blush but it can also be used on your eyes and lips. I prefer it over powder blush. At $39 its pricey but has literally lasted me years and is still going! 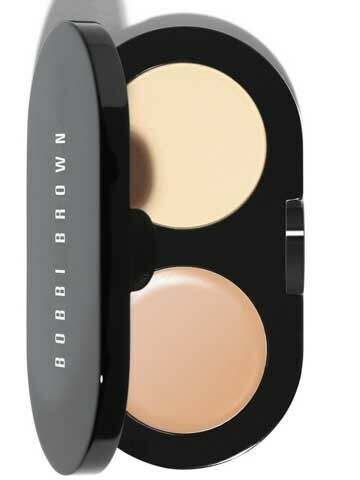 Bobbie Brown Creamy Concealer Kit – A cream and a powder in one and it provides the perfect under eye coverage to look fresh. I don’t use it daily but always gets compliments when I do! $33 and worth every penny. 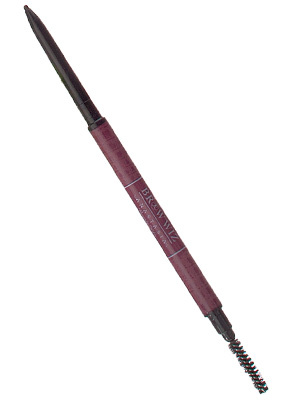 Anastasia Eyebrow Pencil – Once I discovered how great it is to fill in your eyebrows I was addicted. I just recently got this pencil to go for a softer look and I love it. $20 for perfectly filled-in brows. All of these items can be purchased at Sephora, which is where I got them. What are your every day make up essentials? P.S. Just completed my Elf4Health Day 2 Challenge and mailed my friend in CA a little note. It’s only day 2 and I’m having so much fun with this challenge! I have to say, participating in the Elf4Health Challenge is a nice distraction on the Monday after an extended Thanksgiving vacation. I’ve heard back from my initial email to my elf buddy and am looking forward to continuing the challenge together over the next two weeks! To conquer the Meatless Monday challenge, I’ll likely have a salad for lunch and either heat up my leftover spaghetti squash and add some veggies and pesto for a little added flavor. I am inundated with cyber Monday emails and just want to buy stuff! I did start my Christmas shopping on Black Friday and got a few things for people, but need to continue to brainstorm on what to buy everybody else. I may just be taking advantage of cyber Monday for myself! Happy Cyber and Meatless Monday! Guess what? Addy and I are elves! We both signed up to be a part of the Elf4Health Challenge organized by Elle and Lindsay. For 6 weeks we will be part of a daily challenges that will keep us in check this holiday season. The first round is closed but you can sign up for the second and third rounds here. Addy and I have both been assigned elves to buddy up with for the first two weeks. We can email, tweet, Facebook that person and encourage them to keep up with the challenges or learn new recipes, workouts, etc. I’m excited that the challenges kick off today and I’m looking forward to being a great elf. I’m sure we’ll both keep you posted of our elf experiences as the challenge moves forward. I just returned from over a week away so my fridge and pantry are BARE. I’m going to have to hit up the store tonight but I’m not sure what I’m going to make yet. Any good meatless ideas out there? Anyone brave the stores out there today? I did. Yup, I managed to snag a great deal on a TV for my mom for Christmas at Best Buy. I ventured to Walmart and Target as well but Best Buy had the best deal. I went around noon and the store was crowded and looked like it had been ransacked a bit but it really wasn’t that bad. I think if you go out with the determination to find one special item, Black Friday isn’t too bad. It wasn’t like I was mindlessly roaming the aisles looking for random goods. You know? So I mentioned I was going to Zumba with my mom on Wednesday. We went and it was fun but it wasn’t that intense of a workout. The Zumba I’m used to makes me sweat like crazy and is non-stop go-go-go from the moment we start. I still enjoyed going to a class with my mom and meeting the instructor that she loves so much. Yesterday, I piled my plate high with turkey, stuffing, brussel sprouts, salad and cranberry sauce. 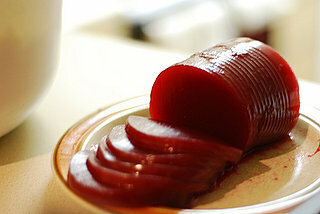 Ok, fine, it wasn’t sauce, it was that canned cranberry log which I LOVE. Anyone else? I’m so glad Addy remembered the 1st Anniversary of District Delights. Happy Anniversary to us! It’s been a great year and I couldn’t ask for a better co-blog buddy then Addy 🙂 Thank you readers and let’s keep it up! Monday’s meals highlight: I already forgot! Happy Thanksgiving and One Year Anniversary! 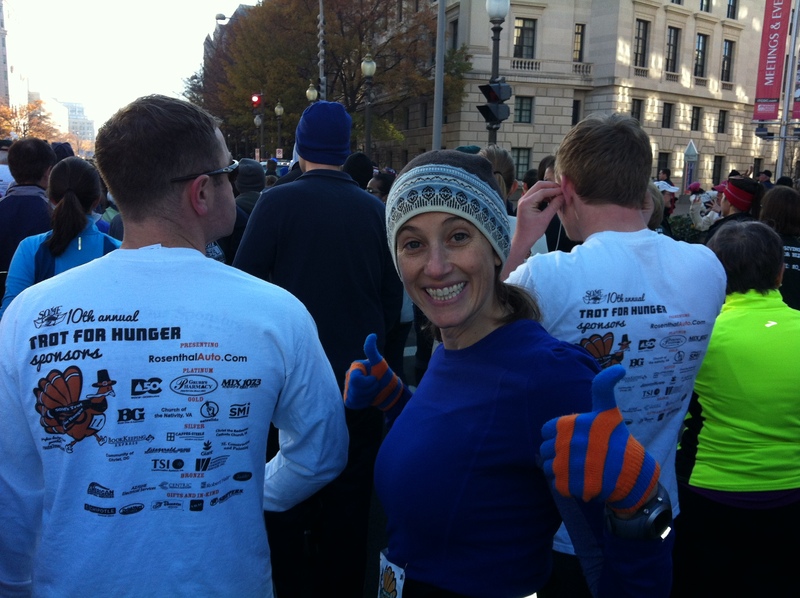 We just finished our third annual turkey trot in D.C. and it was another beautiful morning here. Our nephew ran his first full 5k this morning and he rocked it! He has sat in the stroller or did a little running and then strolling in the past, but this year, he was determined to run the whole thing and he did it!! Congrats little dude! I realized last night, that Stephanie and I never properly celebrated our one year anniversary of District Delights. Our first posts were on the 17th and 18th of November. I am thankful that we’ve been able to carry a blog for the last year! Thank you Stephanie for being a great blog partner and thanks to our reader(s) for reading! I hope everyone has a wonderful Thanksgiving filled with lots and lots of tasty delights! I’ve been home since Sunday and it’s been so nice and relaxing. I can’t remember the last time I had a few days off and wasn’t running off to a wedding or another event. My soreness has finally subsided after two days of rest and a lot of stretching. I’m planning on going to Zumba tonight with my mom – yup, should be interesting – which will be a fun way to get back on the exercise horse. I’ve taken two day trips into NYC and luckily had beautiful weather to walk around and enjoy. 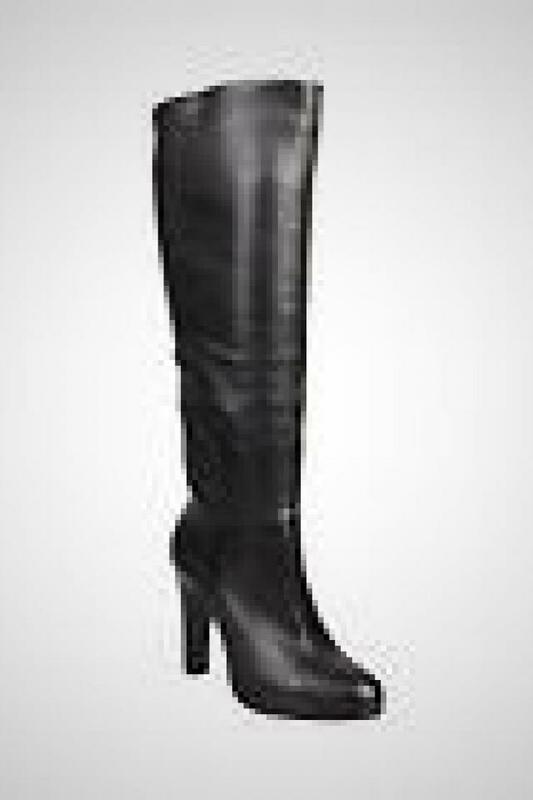 I found a pair of boots my mom can give me as a Christmas present (yes, I am one of those people who likes to pick out presents). And I may or may not have purchased a new coat from J.Crew Factory this morning. 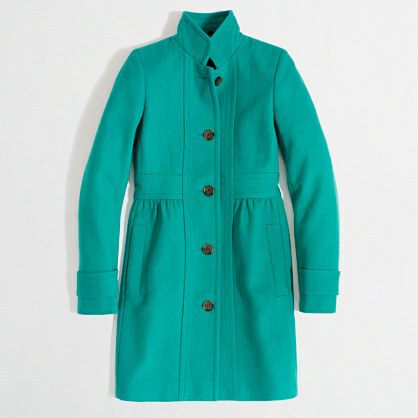 I was on the site buying a Christmas gift for my college-aged cousin and totally fell in love with this turquoise coat. I couldn’t resist with the sale price and additional 15% off. A J.Crew winter coat for $100?! Yes, please. I’m about halfway through The Tiger’s Wife and I’m still not entirely sure what’s happening but I’m really enjoying it. Next up is The Book Thief. I bought the ingredients for the two crostini’s I’m making as appetizers for Thanksgiving tomorrow. I’m doing a goat cheese, fig, prosciutto one (thank you Pinterest and Addy) and a brie and apple one. Cheese is a crowd-pleaser and these will be gobbled up. Now I’m off to watch Pitbull on The Today Show because I can’t seem to sleep in even though I’m on vacation.